corps members before their Atlanta performance. The Crossmen return home to Texas today. That's a sentence that still sounds odd to many longtime drum corps fans after the former East Coast powerhouse moved to the Lone Star State in the off-season. 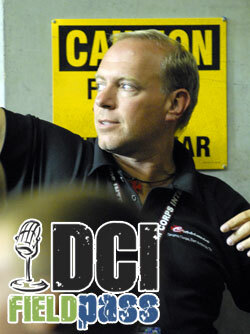 In today's Field Pass, Dan Potter follows the corps members off the field after their performance in Atlanta and talks with director Mark Chambers about the relocation, what he's learned as a new director this season and about the Crossmen's 2007 show, "Metamorphosis." Then, we go inside the corps' post-show circle to hear what Chambers and drum major Jarrett Lipman had to say to the members about their corps' performance in the Georgia Dome. Download and listen now. (MP3, 6.5MB) Listen through iTunes. Subscribe to this podcast.